Auto-correct ruby source code by using rubocop in Atom. This package does not provide default keymap. This package supports auto-run. When checked, it runs Rubocop auto correct. But, it does not run automatically unless you activate this package. You can activate it by running manually Rubocop Auto Correct: Current File once at Atom window. You can enable/disable this option by Rubocop Auto Correct: Toggle Auto Run command at any time. You can correct a file directly if you enable this option. You do not need to save file after correcting it. I recommend you to enable Auto Run & Correct File options. Then, all files are corrected automatically. When this option is disabled, you do not receive any notifications even thought a file is corrected. You can enable/disable this option by Rubocop Auto Correct: Toggle Notification command at any time. When this option is disabled, you will get all rubocop notifications appeared. You can enable/disable this option by Rubocop Auto Correct: Toggle Only Fixes Notification command at any time. 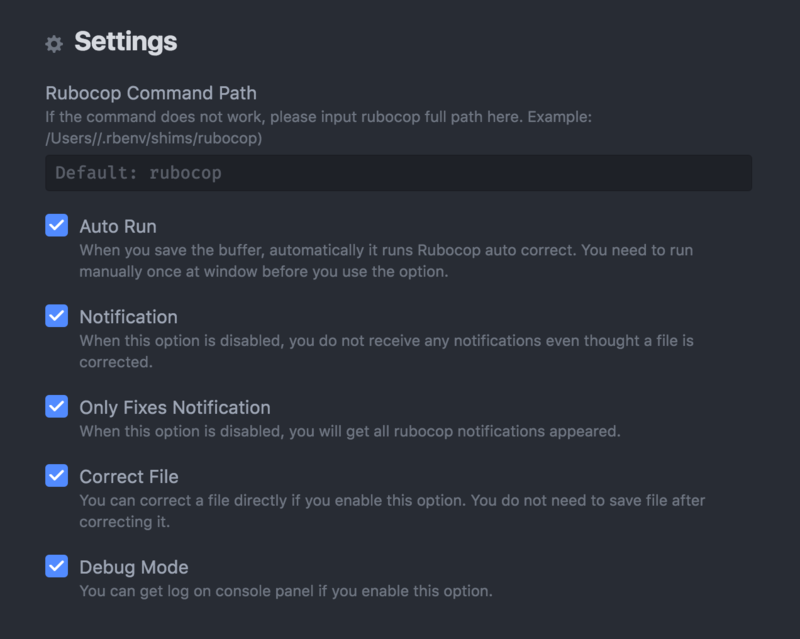 If you already installed rubocop, please check package setting at Rubocop Command Path. For example ~/.rbenv/shims/rubocop. When this option is disabled, you can get log on console. You can enable/disable this option by Rubocop Auto Correct: Toggle Debug Mode command at any time.